The 2010 March Daring Baker’s challenge was hosted by Jennifer of Chocolate Shavings. She chose Orange Tian as the challenge for this month, a dessert based on a recipe from Alain Ducasse’s Cooking School in Paris. 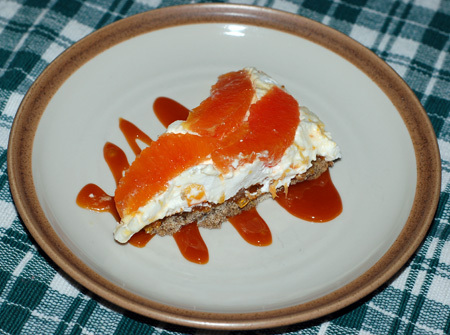 I’d never before heard of this dessert, which is composed of a shortbread/pate sablee base topped with homemade orange marmalade, a stabilized whipped cream tinged with the same marmalade, a fan of fresh orange supremes, and an orange caramel sauce. Although that sounds like a lot of elements when you write it out, they are for the most part fairly quick and simple to make, so I wasn’t too worried. 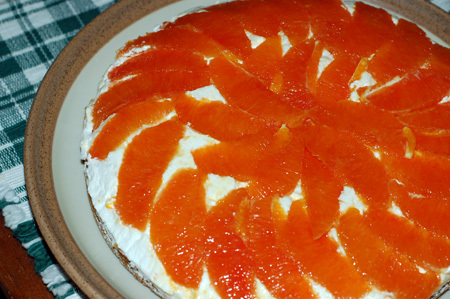 On the other hand, orange desserts aren’t my favorite, and the combination didn’t sound all that appealing to me, a perfect recipe for procrastination. At last, a few days ago, I buckled down and gave the tian a try. 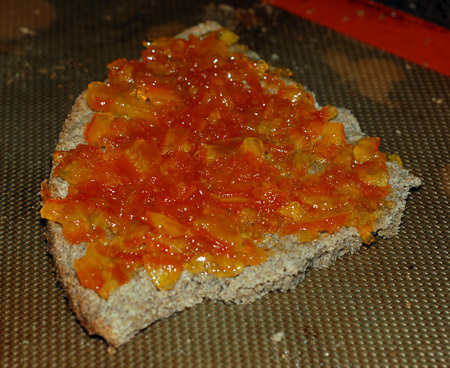 The marmalade was the most time- and labor-intensive, so I started with that. 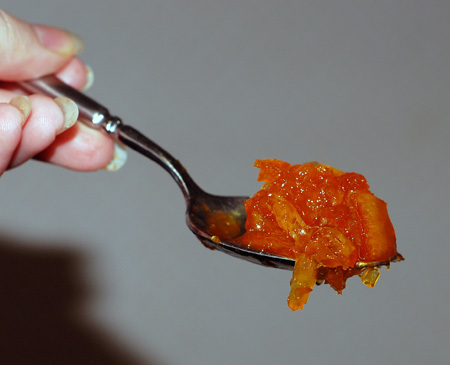 Although I’ve never actually made marmalade, I have tried my hand at jams, and I candied some orange slices for a Daring Bakers challenge back in March 2008. As with that challenge, I chose cara cara oranges to work with for their sweetness and low acidity, and between all of the elements, I ended up needing an entire bag, about 9 or 10 oranges. The marmalade itself was very easy: you blanch the orange slices three times to remove the bitterness from the pith, and then cook them down with sugar and freshly squeezed juice. I didn’t have any pectin, so I cooked my marmalade very slowly for several hours to bring out the natural pectin in the fruit. I actually don’t like store-bought marmalade at all. The combination of bitterness with the chunky texture of the whole fruit just turns me off. But this marmalade came out sweet and soft and full of bright orange flavor, no bitterness—it was basically minced candied orange. I ate several spoonfuls straight out of the pan, and that is saying a lot. It jellied up nicely once it was cool, and I started thinking maybe this tian thing wouldn’t be so bad after all. While making the marmalade, I took the opportunity to cut three more oranges into supremes for another element of the dessert. 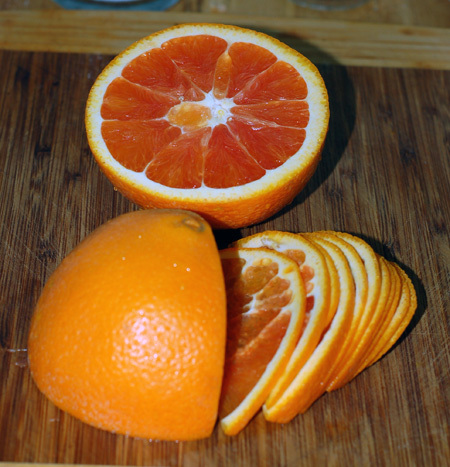 It is very easy to do if you have a sharp knife—cut the top and bottom off the orange, enough to reach the fruit under the white pith, then set the orange on that stable base and cut away all the peel and pith, from top to bottom. 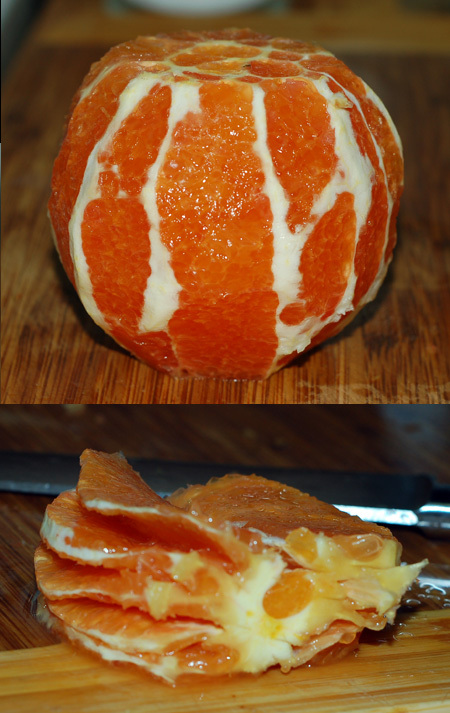 After that you can see clearly where the orange’s segments are, and you cut those away, forming perfect little supremes and leaving the membranes behind. 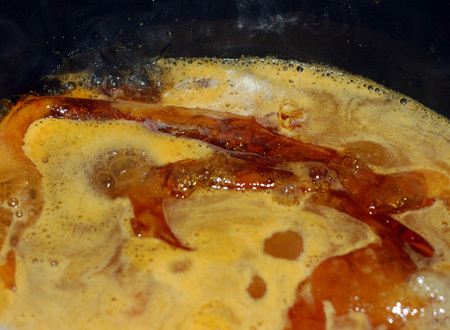 The remains can be squeezed for a bit of juice, and that is what I added to my marmalade as it simmered. The next day, I tackled the caramel, which meant squeezing the life out of another four oranges; apparently cara caras aren’t ideal for juicing. And here is where things started to go wrong. I’ve made caramel lots of times, wet and dry, hard and gooey, so I wasn’t too concerned about it. But the first time I got the sugar heating, I got distracted, and it went right past golden to pretty near burnt. I actually like the flavor of pretty dark caramel, but I thought it might mess up this recipe, and I didn’t have any more oranges to juice. So I scrapped it (I actually poured it off into my silicone muffin pan because I didn’t want to dump molten sugar in the trash or sink) and started again. This time I watched the caramel carefully, and once it melted, I poured in the orange juice. It seized up. I kept my cool, knowing that if I just gave it time, it would dissolve back into the juice. Then I promptly splashed hot orange juice all over my arm trying to stir around the caramel lumps. Fortunately, the orange juice wasn’t superheated yet, so I wasn’t really burned, just unnerved. At last, my caramel dissolved, and I poured some over my reserved supremes, secretly wondering if it would cook the orange slices or possibly set up into a solid lump around them. Neither happened, and I set the caramel aside to work on my cookie base. I had to make the pate sablee base with no AP flour, because I was fresh out (thanks to 3 batches of fresh tortillas inside a week, but that’s another story). The recipe, mostly because of its use of egg yolks, reminded me a lot of my favorite little buckwheat cookies, so I ended up using a combination of bread flour, white whole wheat flour, and buckwheat flour, and it did indeed look and taste very similar, if a bit less crunchy. I don’t have molds or cookie cutters of a comparable size or sufficient number to build my tian in individual portions, so I opted to use my 9″ springform with the bottom removed. I just patted the crust right into the form and baked it in place to avoid any spreading issues. The cookie didn’t really want to come out of the mold, however, and possibly because of its size, it cooked up on the soft side and broke in half when I released it. Then it broke again when I turned it over to spread marmalade on the more uneven top side. The marmalade was a little stiff, but it still tasted delicious, and a few seconds in the microwave made it a bit more spreadable. I was even willing to forgive the fact that the container leapt back out of the refrigerator at me when I went to get cream, and put a nasty bruise on my arm, the one that wasn’t burned. I’ve made stabilized whipped cream before, and it couldn’t be easier. 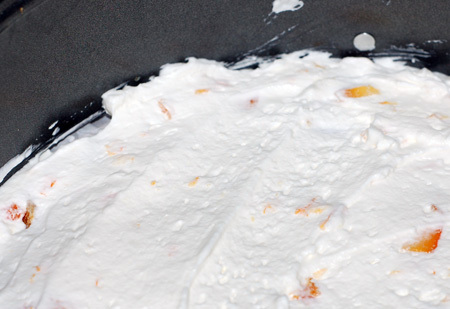 A little gelatin dissolved in hot water helps your basic sweetened whipped cream to hold its shape more readily. I got the gelatin melting, and whipped up the cream with my last dab of vanilla paste, then added the softened gelatin. It apparently wasn’t dissolved enough, because it formed little globs like rubber cement in my beautiful vanilla-scented cream. Into the trash it went, and I started over yet again. This time I stirred the gelatin obsessively, and the cream came together alright, flecked with vanilla bean and marmalade. I lined a plate with parchment—just too small, as it turned out, for the springform to sit flat on, but the largest size I could cram into my tiny freezer—and arranged the reserved supremes in a pinwheel. For a few tense minutes, I thought for sure I was going to run out of orange segments, but I was able to spread them out just enough to cover the entire base of the mold. There was just enough whipped cream to cover the oranges, and I prayed that they weren’t sliding all around underneath. Then the marmalade-slathered cookie base, in 4 pieces. After a tight squeeze into the freezer, I set about trying to get the remaining caramel to thicken up into a sauce. This involved a good 15 minutes of hard boiling, after which it still looked really thin to me; on the other hand, I was starting to worry that it would just turn into hard candy when it cooled. In the end, I decided to give myself a buffer and added some heavy cream to the mix. Shortly thereafter, the caramel finally started to look like a pourable sauce, and it thickened up to a lovely consistency as it cooled a bit, suitable for drizzling. My tian unmolded without irreparable damage, just a few blotchy spots around the edges, which was easy enough to tidy. We all agreed, upon tasting, that it was alright, but a kind of odd dessert. The buckwheat in the pate sablee actually complimented the citrus and caramel nicely, but the fresh orange slices on top just didn’t seem to fit with everything else somehow. I think I almost would have preferred it with more marmalade on top, or better yet, some sunbursts of thinly sliced candied orange. We all finished our slices, but had no inclination to go back for seconds, and the remaining tian is sitting in the refrigerator turning soggy. The leftover caramel and marmalade will definitely be eaten up, but I can’t vouch for the rest. This challenge was certainly different than the usual, and it actually did challenge me more than I expected, so many thanks to Jennifer for the introduction, and check out the Daring Bakers Blogroll to see all the wildly creative variations on this dessert. Finely slice the orange, by hand or via mandoline. 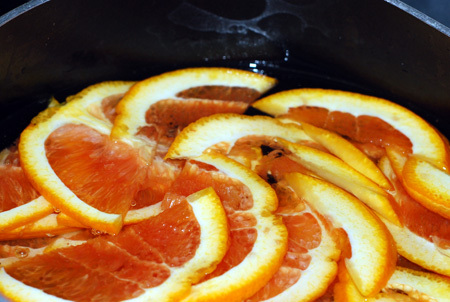 Place the orange slices in a medium-sized pot and cover with cold water; simmer for about 10 minutes. Drain, discarding the water, then refill with fresh water and blanch the oranges again; you want to blanch the orange slices 3 times total, a process which removes the bitterness from the orange pith. 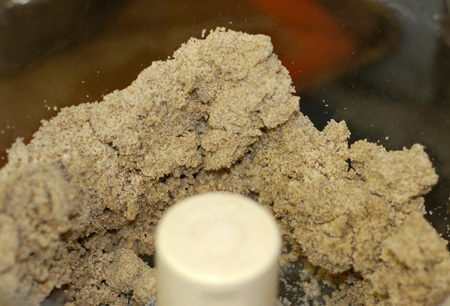 Finally, drain the slices and let them cool enough to handle; mince them finely, using a knife or a food processor. 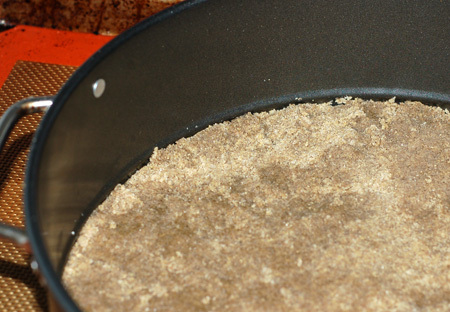 Weigh the slices, return them to the pot, and add the same amount of granulated sugar. If you don’t have a scale, you can place the slices in a cup measure and use the same amount of sugar. Pour in the orange juice and the pectin, if you are using it. Cook over medium low heat until the bits of orange become tender and translucent, and the mixture reaches a jammy consistency (10-15 minutes with pectin, but could be much longer if you do without; be patient). Well it certainly looks well worth the effort you put in! I like the buckwheat crust. Thanks for the tip about orange supremes. Great photos too!